Born in South Carolina, Dr. Moates grew up in Americus and graduated from Americus High School in 1979. 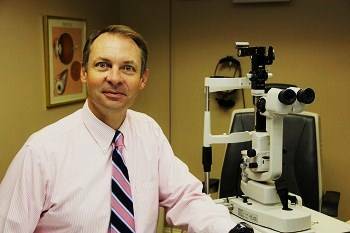 He returned to the Americus area in 1988 to join the eye care practice. He is happily married to Valerie and they have 3 daughters and 1 son. Dr. Moates is a member of First Baptist Church where he teaches Sunday School, served as Deacon, and sings in the choir. Dr. Moates enjoys tennis (played varsity tennis at Auburn), volleyball, basketball and most any sport. However, his most enjoyable time outside the office is spent as a spectator at his children’s various sporting activities!